An interim report has just appeared in the CBA East Newsletter for September 2013, which can be found on pages 6 to 8. It is up-to-date as far as Easter 2013, but doesn’t include any of the exciting details revealed this summer. When I have an interim report ready covering all four seasons’ work, I will post it here. In the meantime, enjoy the image of the small collared urn found in 2012. Although the interim refers to it as “complete”, the conservator discovered that it is in fact only half of the vessel. Unusually for a collared urn, it did not contain any cremated bone and was not an accessory vessel within a burial. 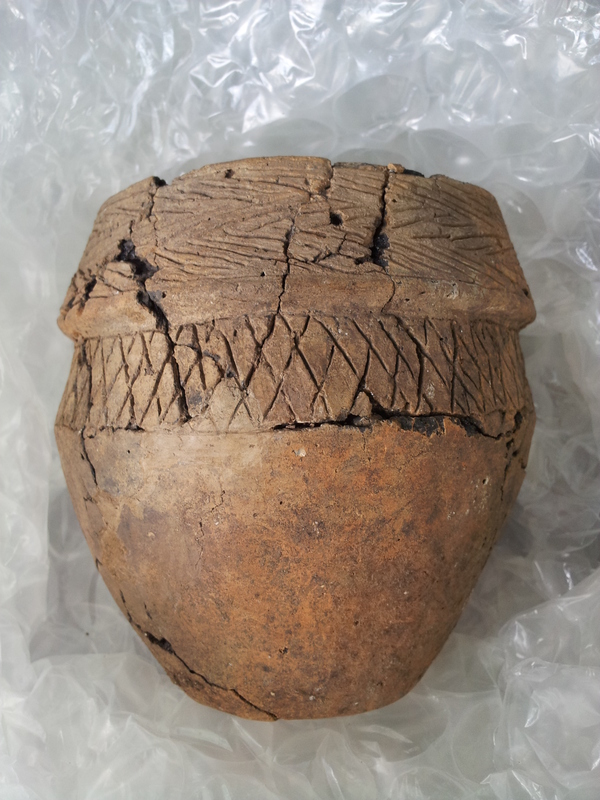 Collared urns are usually associated with the Early Bronze Age, but there are a few with radiocarbon dates stretching back as far as 2500 BC, such as this example from Wilton Moor, Kirkleatham (North Yorkshire). Given the complete lack of diagnostic Early Bronze Age lithics and the rarity of Beaker pottery (I have seen only a couple of sherds, although there are probably more than that) from the Stapleton’s Field henge, we can perhaps suggest that this is a Late Neolithic example of the type. Today is the Day of Archaeology, so I will be tweeting with the hashtag #dayofarch throughout the work on site. One very positive development has already happened: the Licence to remove the disarticulated human bone from site has arrived by email today (number 13-0150), so we can get underway with the investigation of the area where it turned up (and where there is still a piece of human tibia embedded in the ground). All of (255) has now been removed from the inner ditch, revealing what is clearly the primary silt, to which the number (298) has been assigned. It contains a large rimsherd of Grooved Ware, which is good. Any organic material should be considered for radiocarbon dating; nothing from the ditch seems to be later than Neolithic in date. Apart from last year’s bizarre collared vessel, there is nothing from the site that appears to be of Bronze Age date. It will be interesting to see what the vessel looks like reconstructed: Keeley will be collecting it from the conservator in a couple of weeks, so we can have it for the open day. It is horribly dry today. Yesterday morning’s rain made everything soft, but I think that a day of baking sun has made to soil very crusty because there is so much clay in it. Tomorrow’s forecast is for rain in the afternoon, with the possibility of a shower on Sunday morning, so I hope that this will soften the soil once again. It’s also proving to be an issue for the excavation of (119), which showed up as a distinctly red colour yesterday but which has dried into the general greyish colour that all soils tend towards as they dry out. Mick is finishing the plan of the north-eastern end of the site, drawing the strip that Frankie couldn’t fit on her plan. That leaves the south-western half still do to, which I hope we can have completed early next week. Fill (291) in the outer ditch is still producing Roman material, albeit not in huge quantities. What is interesting is to contrast this material with what came out of the trapezoidal enclosure ditch last year, where more than half the finds were of tegula. Although there have been a few fragments in the henge ditch fills, they are much less common. This makes me wonder if this ditch fill (which is presumably third century in date, based on the coin that was found two days ago) either post-dates or pre-dates the fills of the enclosure ditch. It’s too early in the excavation of this section to know. Conditions on site today are ideal: it’s warm (around 21° C) and the cloud cover is preventing the worst of the sun’s effects (although it will still be possible to burn). It looks as if we will at last be able to do a full day’s work on site, though. By the end of yesterday, trowelling back had covered almost half the site and ought to be complete after morning tea-break. Yesterday’s finds are being numbered and assigned to the correct context numbers, ready for recording by EDM. It feels as if we are properly under way after a few days of preparation work. Keeley is about to start planning: it will be good to have an accurate, hand-drawn plan of the site after last year’s purely EDM-based plans, which have never been drawn up using a CAD package. In checking the collection of bone that may be in the south-eastern terminal of the inner ditch, I spotted what appears to be a piece of human tibia, a definite piece of human maxilla and a human molar. There is also definitely animal bone, including a large ?sheep’s molar. This probably means that we don’t have a human burial as such, but a collection of bone that includes both human and animal. I need to check whether we are still covered by last year’s licence to remove human remains from the Department of Justice or if I need to apply for a new one. Just before morning tea break, Deborah discovered a deposit of what appeared to be carbonised seeds against the outer edge of the henge bank. On excavating after the break, the deposit appeared to occupy a distinct hollow around 90 mm in diameter. We have collected the material as a sample for flotation, but I am unsure if this is actually archaeological material as opposed to recent botanical material (simply black seeds that have been taken underground by a burrowing insect or something similar). The finds are being collected quite slowly, although this is only to be expected as there was a huge backlog from yesterday. One of the difficulties is assigning context numbers, as we have only a sketch plan to base them on. I have learned a valuable lesson about relying on EDM data… Once Keeley has done a master plan of the site, things will be a great deal easier. It is becoming clear that the north-western edge of the henge interior has suffered more from ploughing than the south-eastern and that its effects overall have been more devastating than I previously believed. We are on what appears to be chalk bedrock at the north-western edge (and the machine has not helped in removing the thin deposits that survived over it). It has been the presence of the bank to the south-east that seems to have helped retain activity deposits in the centre of the monument. We are fortunate indeed to have started excavation when we did, as I suspect that only a few more years of ploughing would have removed all traces of the site apart from the outer ditch. The chalk bank also seems to have been broader at the base than I first thought: the outer edge consists of well consolidated chalk, while the inner edge is more loose chalk and soil. This makes it around 3 to 3.5 m thick at the base. The inner ditch then defines a very small area inside this, perhaps no more than around 12 by 8 m (I will need to check these measurements against the results of the geophysical surveys). There is still a small patch of topsoil left over the south-western activity deposits and a small section of the bank, (199). It is producing finds of relatively recent date (Bernie has found a piece of medieval or early post-medieval tile, for instance), which is not an issue and certainly ought not to be regarded as contamination once we come to do the initial post-excavation analysis of finds. I think that we will have completed most of the trowelling back shortly after lunch. Philip is about to start cleaning the spur across the outer ditch, which ought not to take long. That can be planned rapidly and work can start in earnest on it. We will be able to accommodate five or six people in here initially; they will be dealing with the deposit of colluvium that fills the top of the ditch. Although this is still technically deposit (35), I think that it deserves to have a new number for the purposes of the excavation. As we are close to the trench dug at Easter, we ought to be able to compare the sequence there with the one we excavate here quite easily. It will be instructive to see if the sequence is as simple as it appeared to be in the machine dug section. Today is the first day that it has been possible to return from lunch to do proper work: over the past three days, it has been so hot by lunchtime, that doing anything afterwards proved a real effort. With the breeze and the cloud cover, people actually refreshed following the break. Bernie has discovered a very nice large sherd of Peterborough Type Impressed Ware. This is perhaps the largest piece we have had from the site. It has a distinct carination with whipped cord maggots either side, so it ought to be easily identifiable to type. Once again, we seem to be getting material from the early days of henge construction. It will be interesting to see what we get from the outer ditch. It looks as if we will have cleared yesterday’s finds and some of today’s by the end of the day, which means that by the end of tomorrow, we ought to be up-to-date with lifting everything. The main issue has been assigning context numbers to everything: last year, we relied on using the EDM co-ordinates to match finds made during the first two weeks to the plan that was only done during the third week and I am determined that we do not do that this year. We do need to sort out last year’s plan data! Where Martin has been working on the bank on the south side of the monument, he has found that it survives only as a very superficial deposit that trowels away with little effort. This means that the deposit beneath is a surviving ground surface from the time of the bank’s construction. This will be a good place to put through a section to examine this relict topsoil. Where Philip is cleaning the outer ditch, it has become clear that there are two deposits visible, confirming the impression gained during topsoil stripping last week. There are a few sherds of prehistoric pottery in the outer deposit, which will be the stratigraphically earlier, and a fragment of what appears to be Romano-British greyware in the inner deposit, which is the colluvial deposit in the top of the hollow, suggesting that the outer ditch was still visible as a slight depression in the Roman period, confirming what we found during the Easter dig. Trowelling back is almost complete, apart from a strip along the south-western edge of the site, which will be used as a barrow run tomorrow during the emptying of the material used to backfill the section excavated through the inner ditch. 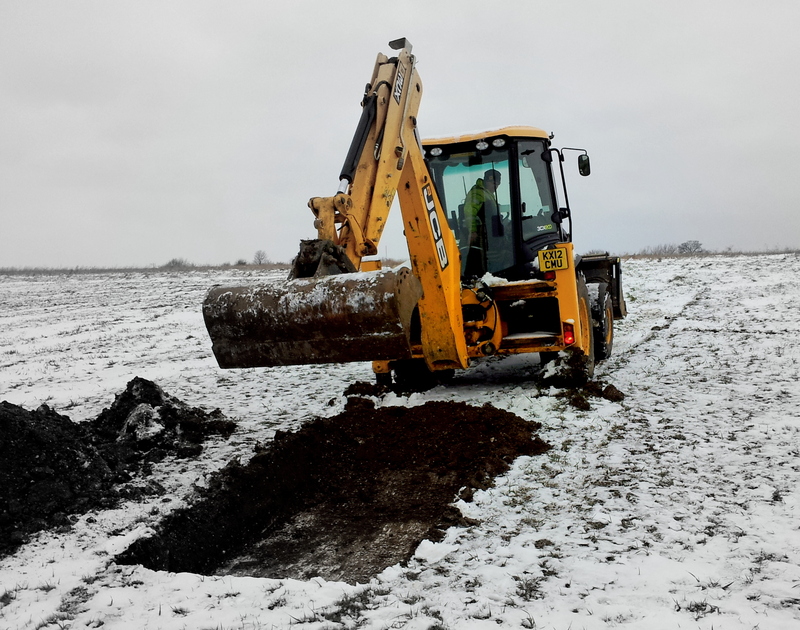 There is only minimal work left to do in the ditch – perhaps only a day or two – and it may be possible to excavate a second section through it (which would mean that we will have two sections through inner and outer ditches). Progress seems to have been far better this year than last; this is despite having fewer people and losing three almost half days to the heat. Although we are dealing with a site that is about a quarter the size of the 2012 trench, this is the area with the most complex archaeology and by far the densest concentration of finds. People really do seem to be more enthusiastic and hard working this year. Perhaps the smaller site makes it more sociable and makes it feel more of a team effort. Whatever the reason, I am pleased. I’ve written a short piece on the henge for the North Herts Museum’s website, which may be of interest. Difficult as it is to believe that we are now in spring owing to the continued presence of snow on the ground and the threat of more to come, today saw topsoil stripping for our Easter weekend small-scale project. 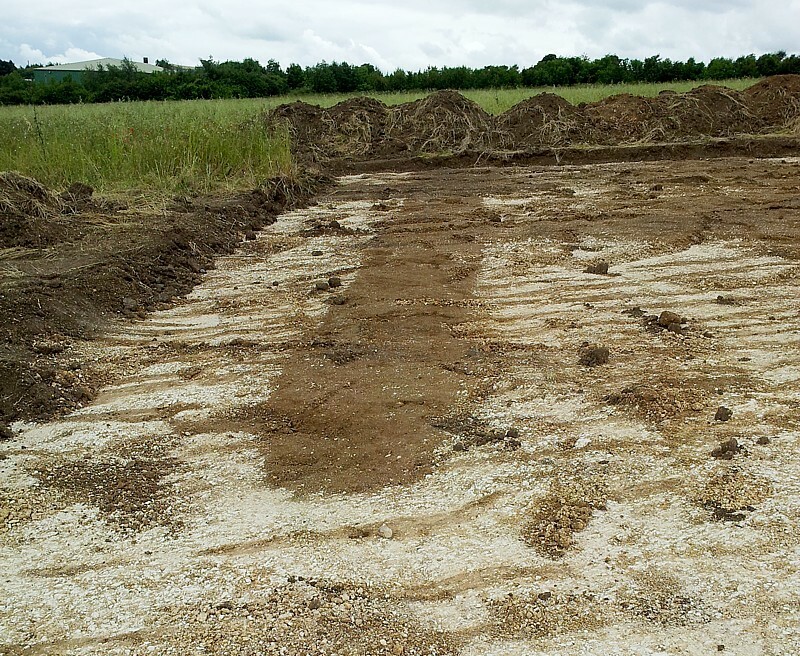 It’s more in the nature of an evaluation exercise than a full-blown excavation: we have stripped a linear trench across the line predicted for the henge outer ditch on the basis of the 1996 magnetometer survey. In previous years, the location of the ditch has been masked by the presence of an unknown depth of colluvium; in 2012, an area of colluvium was removed by machine down to the chalk bedrock, at which point (to the east-north-east of the centre of the henge), it was more than half a metre deep. This was a cause for concern, as the depth meant that we would never get into the ditch fills using the 100% recovery and three-dimensional recording of all finds that we had been practising up to that point. In addition to this worry, I was concerned that the scale of the ditch suggested by magnetometry (between 3.5 and 5.0 m wide at the top) might indicate a commensurate depth. I had visions of Alexander Keiller’s excavation of the outer ditch at Avebury, where the V-shaped ditch was more than 11 m deep, with a width of 21 m at the top: a similar feature at Stapleton’s field might be almost two metres in depth. Then I was puzzled by the results of the 2011/12 resitivity survey, where the spread of colluvium was visible but the ditch was not. On the one hand, I thought that maybe the colluvium was so deep (perhaps a metre or so) that the outer ditch could not be detected at the resolution achieved (at a depth of a metre, using the survey technique employed, most features would be invisible); on the other, I was heartened by the likelihood that a ditch two metres deep would show up regardless of the depth of colluvium sealing it. Either way, I was beginning to suspect that the ditch was of a more manageable size. I arrived on site slightly late (about 8.40) to find Tony, Nigel and Jim chatting to the digger driver. Under the snow, it was possible to make out the outline of last summer’s trench, which made it reasonably easy for me to locate the rough centre of the henge. I had already decided that we would open our exploratory slot down hill from the centre of the monument, where the colluvium was likely to be thinner (we knew from last year’s project that it did not extend as far to the south-east as the Roman enclosure ditch). The machine could then cut a trench up to 20 m long from the outside to the inside of the henge. 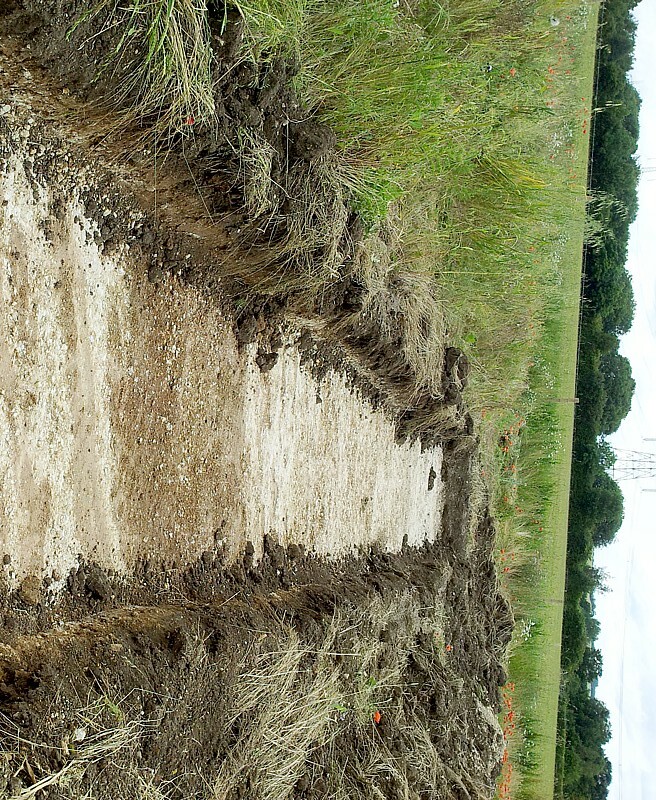 This way, we could minimise the potential damage to deposits within the outer ditch. There was barely any colluvium at the south-eastern (downhill) end of the trench, although it began to show up within a metre or so of the end of the trench. In the conditions on site (it was -2° C and icy), it was difficult to see artefacts within the colluvium, although Tony managed to identify a piece of Roman tegula, with part of the flange visible. After cutting back for over five metres, with the colluvium becoming increasingly thick (it has reached a depth of perhaps 0.25 m at this point), the chalk bedrock suddenly dived down. This was the outer edge of the ditch, exactly where the magnetometer survey had predicted it to be. It was clear straight away that the side of the ditch was not steep, perhaps around 45°, which raised my hopes that it would prove to be reasonably shallow. The machine was used to empty the ditch of its contents. Although it is too early to be certain, it appeared to contain only one fill, which was sterile (or, at least, contained too few artefacts and ecofacts to be visible during soil stripping). If true, this is intriguing. It suggests that the ditch filled in a single episode, in other words, it was deliberately backfilled. If this proves to be the case, it explains how the ditch was so full that a colluvium formed over it north-west of the henge from the Late Neolithic onwards (the infamous context (35) that we spent so long excavating in 2011 in the mistaken belief that it was indeed the upper ditch fill). 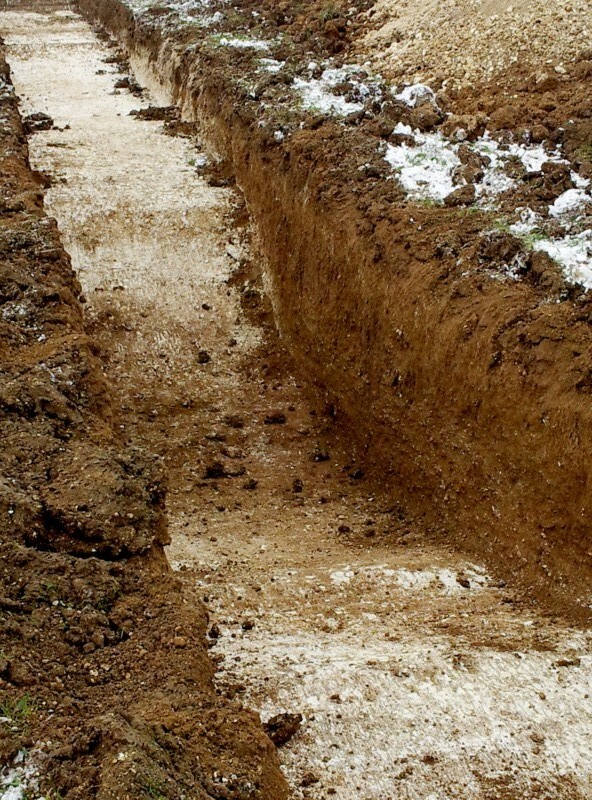 If it is a deliberate backfill, it raises some intriguing issues: why would the outer ditch have been filled and how much effort would have been required for the undertaking. This might be yet another indication that the early ‘formative’ henge was converted to the classic type some time before the middle of the third millennium BC. The ditch proved to be at the upper limit of size suggested by magnetometry, around 5 m at the surface of the chalk. However, its sides sloped quite gently. Although we stopped the digger at a depth of 1.2 m from the ground surface for health and safety reasons, the angle of slope of the ditch suggests that there is less than half a metre of deposit left in the bottom. 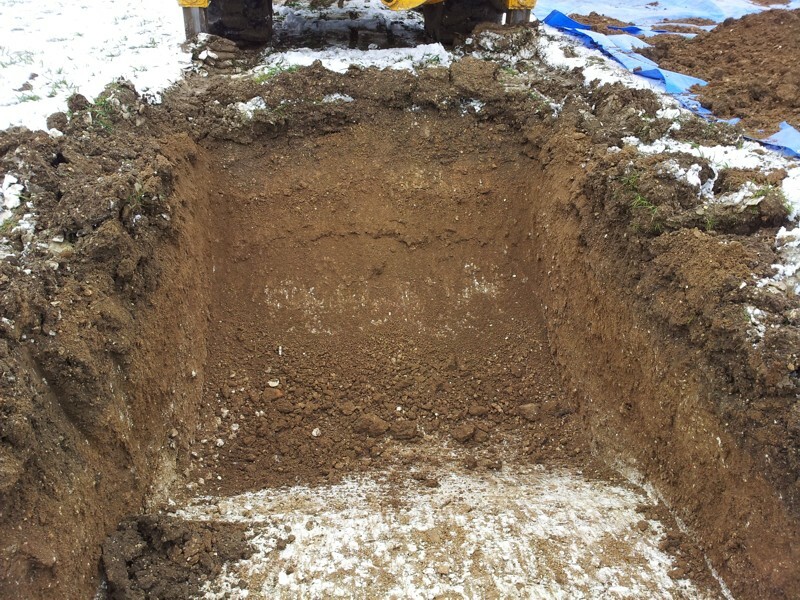 We will therefore be able to excavate a slot through the base, where there ought to be some indication of primary silts (and, I hope, something that can be dated). This means that the ditch is no more than 1.7 m deep (and cut under 1.5 m into the bedrock). This is very encouraging for the summer as it means that it will be possible to excavated a complete section through it by hand whilst maintaining our three-dimensional finds recording system. After locating the inner edge of the ditch, another 1.5 m of topsoil and colluvium was stripped. At this point, over the berm between outer ditch and bank, the colluvium appears to be at least 0.4 m deep, confirming the observation to the north-east of the henge last year. After tidying up the soil scattered by the machine around the top of the trench, we left it until Friday (there is little point in cleaning up inside the trench, as more soil will have fallen in by then). I left around 10.15, while Tony, Nigel and Jim began putting up the hazard fence around the trench as, although it’s in the middle of a field, we need to ensure that people don’t stumble into it in the dark. The forecast for the weekend isn’t good: there is supposed to be a high risk of more snow on Thursday or Friday and temperatures are not due to get above around 5° all week. This is hardly what one expects for an early spring project, but it’s necessary for understanding the monument. I will be back to blogging on Friday, when we return to clean and record what has been exposed. I also hope that it will be possible to excavate the soil in the base of the ditch. If we are lucky, there may be a primary silt with organic remains in it. Today, I hope to have most of the topsoil patches left after stripping fully removed. There is one team working on the western edge of the site, where it overlies colluvium deposit (35); a second group is dealing with the little bits left around the edges of the overdug area where we are establishing a sondage, both inside and outside it. We still don’t have last year’s records or the Munsell™ Color Chart. This will make doing any serious excavation difficult, even impossible. We can assign new context numbers but there will be a gap in the sequence to be filled later. Recording deposits is more of an issue. We began the project by using Munsell™ notation and we ought to remain consistent. I hope that the box with it, the records and (most worryingly of all, the Accident Book) can be found and brought to site as soon as possible. Finds are being made in some numbers in the topsoil (already today we seem to have another hundred or so, and that’s after only an hour of digging). The new efficiency of the finds collection procedure means that I’ve only seen a couple so far, so I don’t actually know what is turning up. I need to get to grips with this, as it is impairing my ability to interpret what is being found, although I can’t see a resolution. If we had a site office, I’d be happy to get objects out if we had a site office, but, being Letchworth Garden City, there is always a breeze, which makes it too risky to contemplate. I realised this morning that the only photographs I’ve taken have been with my ’phone (which actually has a higher resolution!). I’ve remedied this by taking a series of photographs from the tops of various spoilheaps. It has actually been good to get them this morning, as it rained overnight, leaving the soil damp, and the overcast light is very flat and good for general site photography. Some of the topsoil cleaning is progressing quickly and some more slowly; it seems to be largely to do with how many finds there are. Towards the north-eastern corner, where the sondage is located, there are more than on the western edge. I can’t think of an archaeological reason why this should be the case. We do have the nineteenth- to mid twentieth-century field boundary and path (represented on site by ditch ) separating these areas, so I suppose that it might be a product of different agricultural régimes when the boundary was in use. The terrace on the slope that is occupied by the henge is much better appreciated now that the topsoil has been stripped. Although the bank evidently runs downhill from the terrace, the enclosed area is on more-or-less flat ground. This makes me wonder if the bank is better preserved higher up the slope; it is certainly very poorly preserved down slope from the centre. There have been no really spectacular finds (that I’ve seen) so far. 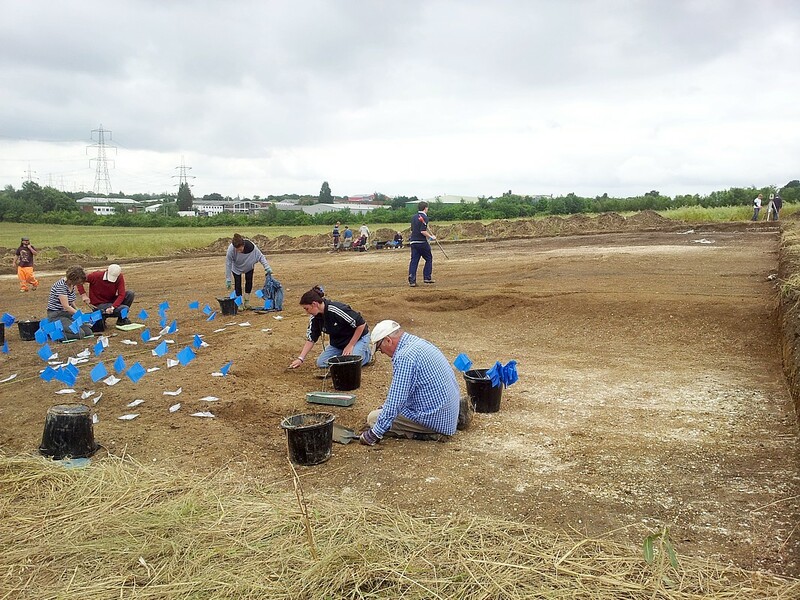 It is obviously very early days still, although Phil Thomas found a nice sherd of grooved ware on the henge last weekend, which he rescued and will bring it in on Sunday. Perhaps when we are digging into the colluvium, we will find more of the interesting material. The students have been a real bonus this year. I was a bit apprehensive about having so many on site after my bad experiences with feckless students at the amphitheatre in Chester, ten years or so ago. This lot are so completely different: they are motivated, reasonably experiences, interested in what they are doing and, above all, they are competent. I wish they were staying for the whole six weeks. I have especially to thank Rebecca Harrison, Rachel Mills, Navid Tomlinson and Ewan Chipping among the students as well as Christl and Caoimhín for staying late (until 5.30) on Wednesday to finish recording the finds. Chris Hobbs, Alan Goodwin and Evelyn Goodwin came to visit the site mid afternoon. Alan and Evelyn won’t be digging, so this is an opportunity for them to see the site at an early stage. Excavation begins on site tomorrow. We have opened up a square 40 m by 40 m with a small spur to the east; this has exposed almost a third of the henge, highlighting how small the second phase monument would have been, while the spur has crossed part of the ditch of the small ring-ditch east of the henge. It has become more apparent that the henge occupies a slight terrace on the hillside: this helps to explain its slightly unusual position, as henges usually occupy flat ground, often on valley floors. To understand the background to what we hope to achieve over the next two summers, read the Project Design and Pauline Gimson’s report on the resistivity survey carried out earlier this year. 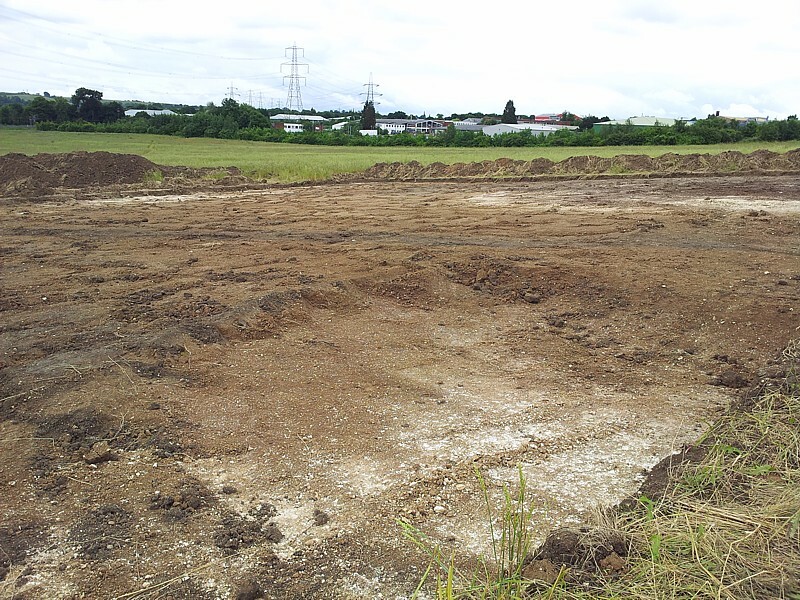 Having confirmed the character of the site in 2011, we now need to learn more about its date, history and use. This year, I also hope that we will actually identify the elusive outer ditch (its entire circuit appears to be maked by a build-up of colluvium, soil that has crept down the slope) and retrieve material thay will help us to date its filling. In particular, we need to collect materials suitable for scientific dating (organic material for radiocarbon and, perhaps, fired clay for thermoluminescence). As ever, I will be blogging about the site every day, so you can keep up with discoveries. This is especially important for those of you who will be working only occasionally on site: you can find out what has been happening to “your” part of the dig. I made a quick visit to site this morning and it is looking impressive. 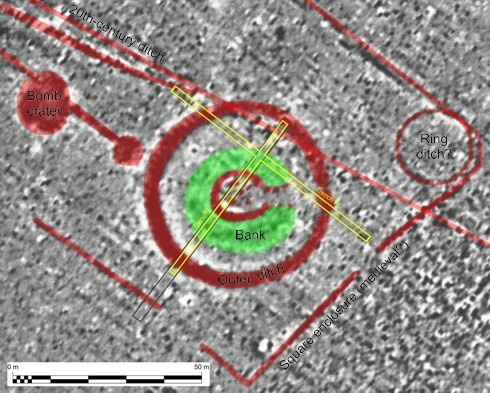 Almost a third of the henge bank is exposed, with the activity deposits showing up in the centre as organic-rich soils, while the secondary inner ditch can now be seen in plan, at least for part of its circuit. The puzzling outer enclosure ditch has been exposed at the bottom of the slope and we have termini either side of an entrance. There is also a ditch belonging to the ring ditch east of the henge visible in the spur along the north-eastern edge of the trench. There is clearly a lot of cleaning to do (it’s a huge area), but all thanks must go to Keeley Hale and Mick James for supervising what I understand to have been a very difficult topsoil strip. They have done a great job!